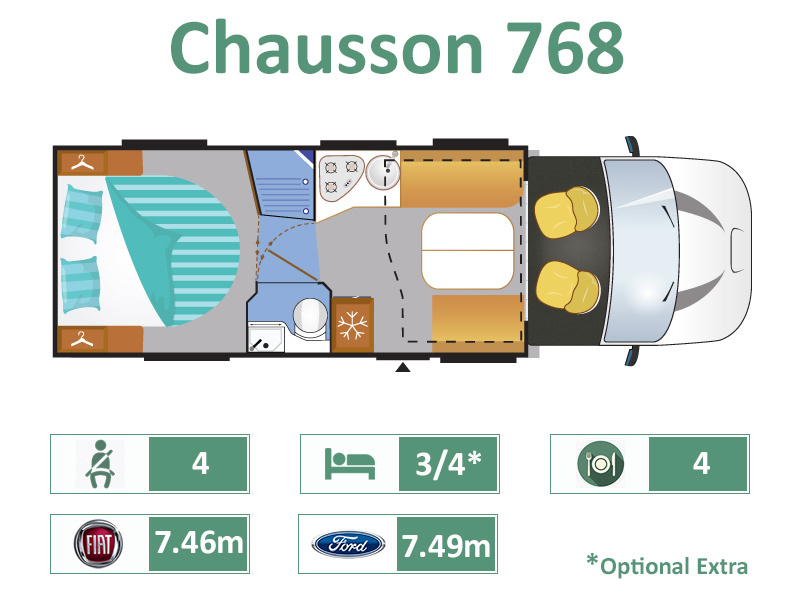 You might imagine that you have stepped into a Chausson 738 model here, they are remarkably similar … It`s also an accomplished 7 . 5 metre low profile, with optional electrically operated drop-down bed over the forward Smart Lounge beneath, and a rear height adjustable 5` 2” wide double bed over a large garage beneath. The bedroom has good storage options, and also en-suite shower and toilet cubicles, with washroom doors and not the concertina louvred doors fitted in other models. The 768 model also has a well equipped mid-kitchen with large fridge and separate freezer, and throughout feels spacious and welcoming.